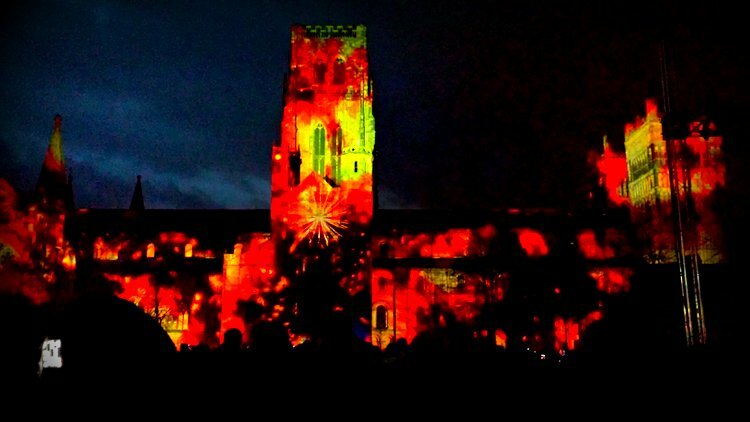 Durham Cathedral is on fire, and everyone’s cheering. Flames licks up the time-blackened battlements, turning the sea of faces around me a lurid footballer’s-wife orange. In its thousand-year history, Durham’s never suffered a serious attack – the closest being the final battle of a failed Scottish invasion of England a few miles and seven centuries away. The only person to successfully storm the cathedral was Henry VIII, and he didn’t use the front door – but it weathered a greedy royal plundering, it weathered everything else (including, you know, the weather) and here it stands today. For a second I forget the context, and it’s all very surreal. We’re stood in the rain, a thin drizzle that will later turn to a thundering assault. Everyone’s rapt, heads craned back, faces flicking with reflected light. It’d be Orwellian if it wasn’t for the expressions. Even A Clockwork Orange didn’t feature eyes as wide as this. Mouths are open in pure wonder. Lumiere has begun – and I don’t know where anything is. The barriers are a big hint. Visitor numbers were so high in 2011 that crowd flow became a big issue, leading to the implementation of a crowd control system during the next festival, two years later. Good job too: it attracted 175,000 people, and Durham is tiny. Space on this peninsula is so tight that the city itself has spilled outwards, crossing the river that forms its boundary on almost all sides, and now it stretches far to the south, where the city’s university now sprawls. Out there, walking around is manageable. In here? It’s packed. I retreat. Popping back to my room at the Radisson Blue for a raincoat and a hastily-gulped coffee, I stroll along the river in search of entertainment – and find a cloud. Closer inspection reveals that it’s made of light bulbs, 6,000 of them, all operated by yanking on the appropriate chain. Considering the sky, it’s all very apt. Clearly Cloud‘s designers Caitlind R.C Brown and Wayne Garrett had heard about the amount of rain Durham usually receives in November. Hopefully, anyway – this sucker’s electric. Like everyone else I pull on a chain or two, enjoying the weirdness of it, and think up a game: “Turn All The Lights Off/On In 60 Seconds.” A quid a go. There are 200,000 people at this year’s Lumiere. Missed opportunity, guys. The Lightbenches will be a permanent feature of Durham’s riverside after Lumiere wraps, so I’m guessing they’ll need to build Lost Property offices alongside them as well. A short stroll away, a whale’s huge tail is erupting from the water, flipping lazily and going back under. It’s a beautiful illusion, and the sequel to 2013’s most popular display, Elephantastic, the work of Top’ Là Design. This year’s piece requires a calm river and an artificial mist of water that can be used as a projector screen. It’s striking, and I now feel bad for the folk on the festival’s third night, when Mysticete‘s final performance was cancelled due to rising water levels, because of the rain. Ah, the rain. I know I keep coming back to the rain, but then, so did the weather. Yet it brought out the very best crowd spirit. If you want British people to feel cheerful, gregarious and absolutely determined to have a great time, throw some rain on them. You’ll see this with family outings to the seaside in January. The kids are shrieking, the rain is churning against the windscreen like a washing-machine on rinse, and everyone’s trying to unwrap a number of damp sandwiches that the thermos has squished into shapes that would give H.R Giger nightmares. Nevertheless, there’s an air of quiet satisfaction in the clammy, spectacle-fogging air: We did this. We beat the weather. We won. Every time the rain gathers its strength and blasts down like a weapon made of water, we head for doorways and awnings and the undersides of trees, and there we look at each other, shaking our heads and laughing. Complaints are half-hearted and amiable, laced with the thrill of it – and absolutely unconcerned. It’s raining – so what? Haven’t you seen rain before? Think what you like, but getting annoyed at rain is a bit daft, right? Do you want a crisp? Sorry it’s a bit damp. All the lights in Durham are alive tonight. They dance against buildings, they hover above the river in a clot of fog. A glowing projection ripples and shatters every time someone walks past it. Between the inner and outer city is strung a web of colours called 1.26 Durham (Studio Echelman), referencing the 1.26 microseconds added to the Earth’s rotation by the 2010 Chilean earthquake. But my favourite piece of Lumiere-style interactivity comes courtesy of Durham’s emergency services. Asalto Durham (Daniel Canogar) involves members of the public climbing up the railway station’s viaduct arches. More specifically: they were invited to crawl over a horizontal green screen a few months ago, and the filmed results are now projected vertically against the side of the bridge…. All very fun. But then the local police joined in, and they really got into it – “helping” other people as they reached the “top”, then clambering everywhere while stretching out police-tape behind them, until the whole bridge looks like a Christmas present from Jim Bergerac. Not to be outdone, the local fire-brigade had a go next, actually clambering down the screen/bridge to help other people up. And apparently none of it was scripted. Grown adults behaving like children, in the very best, most inspiring sense. Watch my video of it here. Durham is a city founded on a rattling good yarn (more on that another time), and Lumiere also acts as a storytelling platform for local history and modern social issues. Late in the evening I haul my weary, sodden frame through the backstreets of greater Durham until I find the house I’m after. I can’t miss it – it’s strobing like a malfunctioning TARDIS. But that’s my lot. The weather’s done me in. Nevertheless, one more surprise awaits. It’s modest-looking, snuck into the foyer of my hotel without much announcement or fuss, but it resonates. It’s like they knew I was coming. Next time Lumiere’s on the horizon, head in that direction. (Expect the next one in 2017.) It’s an exciting, mind-expanding, mouth-gaping time to be exploring one of the north’s most dramatic and beautiful cities, and it’s a great showcase of what can be achieved with a little light and a lot of imagination. Just remember to bring a raincoat, ok? I was thrilled, awed and rained on as part of this year’s Must Love Festivals coverage of Lumiere, supported by Lumiere itself, Artichoke, Visit County Durham and Visit Britain. All opinions, philosophical asides and herculean efforts to avoid making pathetic light-related puns (“bright spark”, “shed some light” etc.) are proudly my own, and I dare anyone to hold a candle to them.